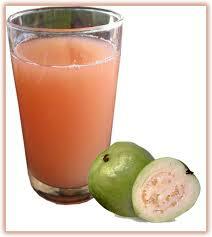 Guayaba Colada (Guava Colada) - Tienditadepuertorico.com - Buy Puertorican Food Here!! with 2 cups of crushed ice. Blend until thick and frothy. Garnich each glass with a slice of fresh guava. These two servings are a beautiful rose-violet hue.